08 Sep The Bulbs Are Here! The Bulbs Are Here! ‘Waterlily’ Colchicums, culinary sage, and Allium thungbergii ‘Ozawa’ (an October/November bloomer) on the south side of my house. Fall is so exciting! 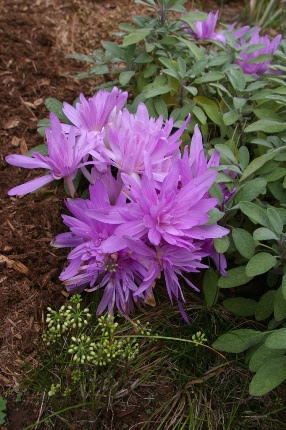 also have FALL blooming bulbs such as the Cochicum ‘Waterlily’ shown above, single Colchicums, and gourmet saffron crocus. Colchicums are one of my favorite surprises of September. You plant the bulbs NOW, as early as you can get them in the ground. They flower in September and October. Because they are super hardy and completely vole and chipmunk proof, they come back with more and more flowers every year. Their life cycle is backwards from what you are used to. They grow leaves in the spring. In summer the leaves are dormant. The flowers bloom in the fall, without any leaves, making them tons of fun to weave in among other plants as a surprise (such as the black mondo grass above). I often cut down Nepeta (catmint) to the ground in late July and the Colchicums come up through the low, reblooming mound. In my own garden at home, I intermingle them with culinary sage and super late blooming dwarf Allium ‘Ozawa’. In another spot, I pair them with Sedum ‘Autumn Joy’. The possibilities are limitless. Come in and get some Colchicums in the ground this week. Your September garden will thank you. My New England asters are starting to flower. 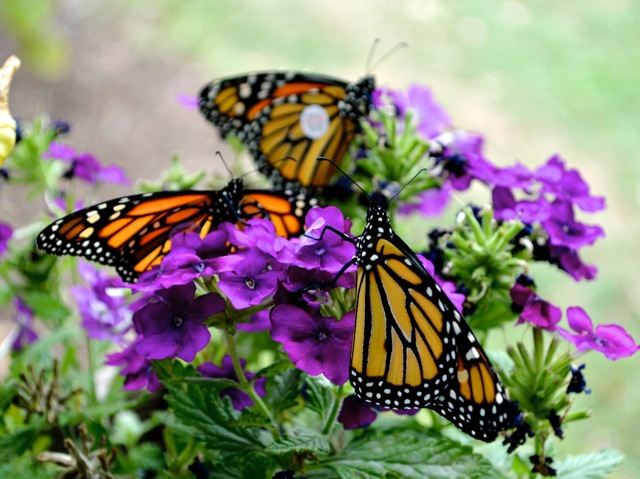 This is ‘Alma Potschke’, an oldie but a goodie that offers brilliant color in September, beloved by pollinators, and a vital nectar source for migrating monarch butterflies. Will you come Play with Flowers with me this Saturday? this work much easier. After the garden walk, I will be teaching the SeptemberPlaying with Flowers. 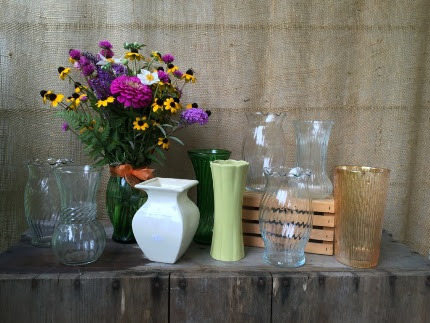 I have been collecting lots of vintage vases on my travels and the palette of flowers we will be playing with is quite different from last month. There are 8 spots, so be sure to register TODAY. Why not share this creative, fun activity with a friend. I can teach anyone how to arrange cut flowers. It is also a great workshop to inspire you to plant more perennials, annuals, shrubs, grasses, and herbs that you can harvest at home. 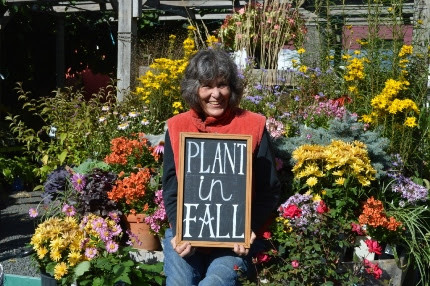 Also on Saturday, Suzanne will set up a Natureworks educational booth at the Wallingford Farmer’s Market from 9:00 am – noon. The details on all of the events this week and next can be found in the Upcoming Events box below. 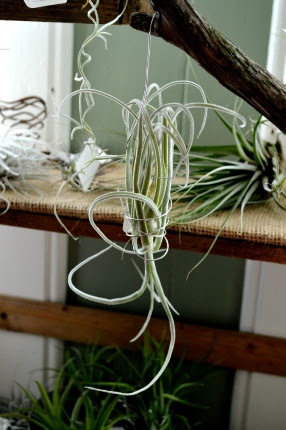 Amber wanted me to be sure to mention that we just got in a fresh shipment of air plants, our first in quite a while. She will be working her magic displaying them in lots of creative ways as you start thinking about decorating your indoor spaces at this time of year. Diane wants me to remind you that thebeneficial nematodes are arriving this week and that NOW is the best time to apply them to your lawns if you have a grub problem. This is an all-natural, safe and effective way to reduce the grub population. Now is also the time to renovate your lawn using organic topsoil, compost, fertilizers, and our own custom grass seed blend. Fall planted lawns make sense and do so much better than those planted in the spring. 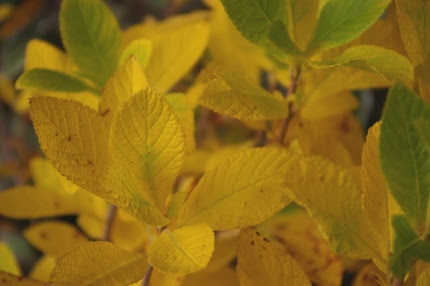 Clethra not only has sweetly fragrant flowers, it has a beautiful fall foliage! wild “back forty” where I cleared tons of bittersweet a few years ago. Nature abhors a vacuum so if I don’t replant it, weeds (and more invasives) will reestablish. Because my soil is thick clay, I am taking home some native Clethra ‘Hummingbird’ (summersweet) to fill my yard with sweet fragrance, attract butterflies, and spread to form a hedgerow for wildlife. As I wander our benches, I am thrilled to see so many rare treats. We have the native woodland wildflower bottle gentian, which I usually see when hiking in the woods at this time of year. We’ve got a nice selection of crape myrtles, sun loving shrubs which bloom no matter how hot and dry. I look out my living room window every day and admire mine. It is such a happy, carefree plant. 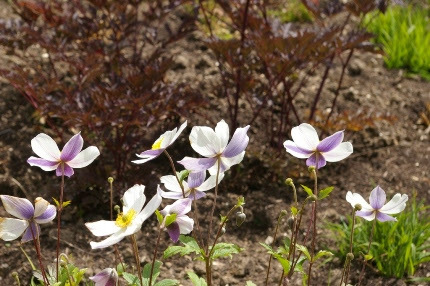 Can you see why this new Anemone ‘Wild Swan’ is the talk of the gardening town? I took this photograph in England at a garden designed by Piet Oudolf. We now have it on our benches! We have Astilbe ‘Chocolate Shogun’, Lobelia ‘Black Truffle’, Anemone ‘Wild Swan’, Geum ‘Totally Tangerine’, and lots more. With new shipments of fresh plants arriving all the time, fall is FUN and SO exciting at Natureworks. Be sure to set aside some time for a visit this week.